Summer J. Artisan Ice Pops has reinvented the summer classic frozen treat. Since our humble beginnings at the Delaware farmers markets, we have produced the most unique, delicious ice pops in town. Our pops are certified vegan, dairy free, and gluten free which are available in local food venues or by special order. We make the frozen pops in small batches with the best all-natural, organic and locally sourced ingredients whenever possible. Our product is fun, exciting, and a grassroots Delaware brand that has gained quite the dedicated following and has a strong social media presence. Recently, Summer J was voted Best Of Delaware 2018, as the Summer Cooler. A summer season is not complete without the coolest dessert in town. We offer an eye-catching package design, and delicious trend flavor profiles that connect to all ages. 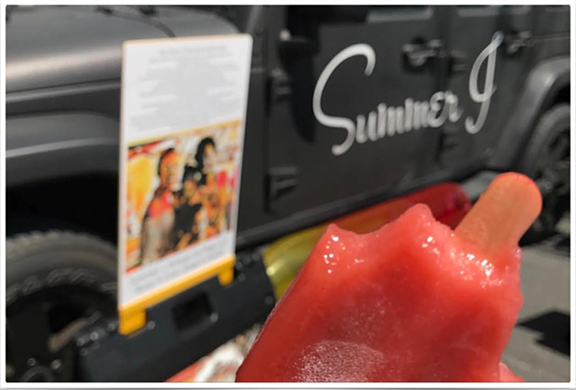 If you're looking for an unique new product, with proven sales, look no further than Summer J. Artisan Ice Pops. You will enjoy “ the taste of summer ” beach not included! For inquiries and orders, please visit our website at www.ilovesummerj.com. Our Story: Shortly after our daughter Summer J. was born, a family member was diagnosed with cancer. It was out of this crisis we became committed to creating something healthy for all families and communities, so we created Summer. J. Pops!